"Our study suggests that California’s strict regulations—on firearms, generally, and on gun shows, specifically—may be effective in preventing short-term increases in firearm deaths and injuries following gun shows," the study’s lead author, Ellicott Matthay, a Ph.D. student at the University of California, Berkeley's School of Public Health, said in a statement released with the study. The study did not, however, note the legal hurdles involved with a California resident purchasing a firearm in Nevada or any other state. Federal law only allows Americans to buy guns outside their home state if they are purchasing a rifle or shotgun from a federally licensed firearms dealer. Those dealers must conduct a background check on the purchaser and are limited to sales allowed by the purchaser's home state. Sales of handguns by licensed dealers and sales of any firearms by private sellers can only be done legally if the firearm is transferred through a licensed dealer in the purchaser's home state where the sale would be subject to the laws of that state. Because of federal rules, all legal firearm purchases a California resident makes at a Nevada gun show would still be subject in some form to California's gun laws. "Generally, a person may only acquire a firearm within the person's own State," according to the Bureau of Alcohol, Tobacco, Firearms, and Explosives guide on interstate firearm purchases. "Exceptions include the acquisition pursuant to a lawful bequest, or an over-the-counter acquisition of a rifle or shotgun from a licensee where the transaction is allowed by the purchaser's state of residence and the licensee's state of business." John Lott, president of the Crime Prevention Research Center and author of More Guns, Less Crime, said flaws in the study's approach invalidate its findings. "It's poorly done research," Lott told the Washington Free Beacon. "It's one thing to spend money on research, it's another to spend it on this type of thing with so many parts of it that just don't make sense." Lott said he didn't understand how it's possible to conduct a study evaluating a two-week before-and-after period. 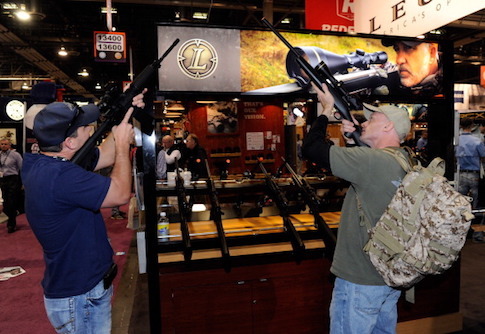 Las Vegas and Reno are where the vast majority of the gun shows occur, and they take place nearly every weekend. "Every two-week before period is another show’s two-week after period," he said. Critics also questioned why the study didn't evaluate Nevada gun-related injuries, just injuries in California areas within a one- to two-hour drive of Nevada gun shows. "Firearm death data is readily available every place," Lott said. "I assume that injury data is also available there, but they have no explanation for why they only look at Nevada’s effect on California and not on Nevada." Lott also pointed out that most studies try to see what happens to a relationship before and after laws are changed and how those changes compare with jurisdictions that haven’t changed their laws over the same period of time. "Different time periods for the after effects in California from California and Nevada gun shows might be because of what the authors say, but when you are only dealing with two states and neither is changing any of its relevant laws during the period studied, you can't know whether it is the different periods of time studied or something else that is driving the result," he said. Still, the researchers conclude that Nevada gun shows translate to more firearms deaths or injuries in California. The study does not establish whether the guns involved in those injuries were acquired through the gun shows or through other means. Despite the lack of a direct link between the firearm responsible for the injuries in questions and gun shows, Matthay said the study "suggests that travel to less-restrictive states may threaten the effectiveness of firearm laws within California." "When a less-restrictive [state] is next to a state that is more restrictive, there may be spillover effects," she said, although she noted that "more research is needed to know for certain." Lott also questioned that conclusion. He said the researchers ignored peer-reviewed studies that look at crime rates after states pass or rescind background checks on the private transfers of guns. Lott said his own research had identified a 2 percent increase in firearm murders after laws requiring background checks on private transfers are enacted. Gun rights proponents criticized the study as well. The Firearms Policy Coalition said most gun studies are designed to support gun control. They specifically criticized Professor Garen Wintemute, director of the Violence Prevention Research Program at UC Davis, and his role in producing the study. UC Berkeley did not immediately respond to a request for comment on criticisms of the study.